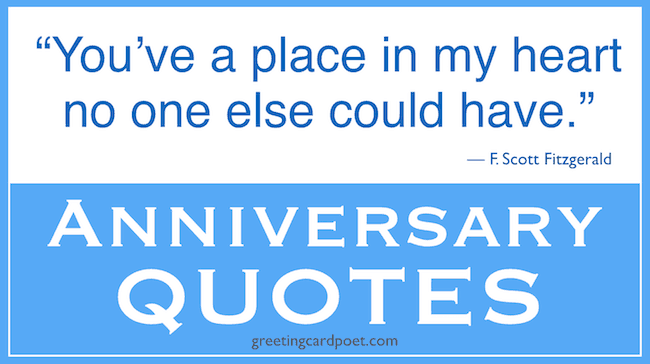 Our collection of the best anniversary quotes are a great resource when you’re in the position of needing the right words for an anniversary card. Anniversaries are significant milestones in a relationship. It is the occasion to remember where you started from and ponder where you are heading. The time to renew your promises and strengthen your relationship. It is a celebration of the success of your relationship and a commitment to the future. Anniversaries are much more than just modern day celebrations. They also create precious memories that become part of your relationship and you can cherish in the future. Whether it’s the first anniversary or a golden jubilee, anniversaries have always been held close to heart. Here are some beautiful anniversary quotes you can share with your loved one and make them feel more special. A successful marriage isn’t the union of two perfect people.. It’s that of two imperfect people who have learned the value of forgiveness & grace. It takes just a moment for me to say that I love you, but I will spend my lifetime trying to show it. Love is the emblem of eternity, it confounds all notion of time, effaces all memory of a beginning, all fear of an end. You have made me a complete person. You are everything to me. And I cannot think of living life without you. And I love you forever. Here’s my love, take it. And, here’s my soul, use it. Here’s my heart, don’t break it. Here’s my hand, hold it and together we will make it forever. Love is not about how many days, months or years you’ve been together. Love is about how much you love each other every single day. For you wake one day, look around and say, somebody wonderful married me. Anniversaries are like a vintage wine, better and better all the time. The secret to having a good marriage is to understand that marriage must be total, it must be permanent and it must be equal. You can’t stop loving or wanting to love because when its right, it’s the best thing in the world. When you’re in a relationship and it’s good, even if nothing else in your life is right, you feel like your whole world is complete. God, the best maker of all marriages, Combine your hearts into one. Side by Side, Year by Year. You are the greatest thing that has ever walked into my life. Another year to create precious memories together. Another year to discover new things to enjoy about each other, and another year to strengthen a marriage that defines forever. Knowing that I get to spend my life by your side makes me smile a little brighter each new day. The best love is the kind that awakens the soul and makes us reach for more; that plants a fire in our hearts and brings peace to our minds …. That’s what you’ve given me and that’s what I hope to give to you forever. And I’d choose you; in a hundred lifetimes, in a hundred world, in any version of reality, I’d find you and I’d choose you. Even after all of this time together, I still find new ways of falling in love with you. Always strive to give your spouse the very best of yourself; not what’s left over after you have given your best to everyone else. It does not matter where you go in life, all that matters is who you have by your side. The day is here again, I can’t remember every moment of that day, but I could remember when I first looked into your eyes. When you make a sacrifice in marriage, you’re sacrificing not to each other but to unity in a relationship. You are my yesterday, my today, my tomorrow, and my forever. I will love you until the end of time. If I had my life to live over again… I would find you sooner so that I could love you longer.